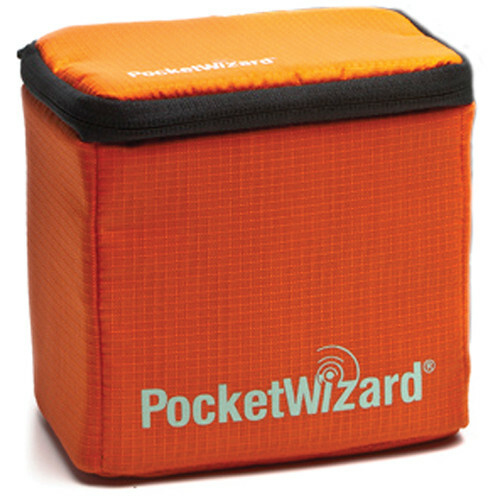 The orange G-Wiz Squared Gear Case from Pocket Wizard is a padded, rip stop nylon case that holds up to four Pocket Wizard Plus III Transceivers. The case opens from the top via a three-sided zipper giving you full view of the contents. The G-Wiz Squared features a zippered interior pocket for connector cables and other small accessories. Padded touch fastened dividers allow you to configure the case to suit your gear needs and help guard against incidental contact and impact. Snap Closure attachment straps allow you to mate the case with another bag. The case is backed by a one-year warranty from Pocket Wizard. Box Dimensions (LxWxH) 5.5 x 5.0 x 3.5"
G-Wiz Squared Gear Case (Orange) is rated 4.4 out of 5 by 42. Rated 1 out of 5 by danrusso from Not ready for prime time I purchased this gear case thinking it would be able to store 4 pocket wizards with a caddy for each one. I was so wrong. This case is super small and super tight. In fact when you buy a pocketwizard plus III you will have to jam all of your cables into the super small mesh pocket which isn't wide enough to easily fit cables gently folded... hence jamming the cables into the pocket. Just make sure you can use the straps to attach it to your camera bag... I simply use it for storing my pocketwizards. If I need them out in the field, I put them into my camera bag. Rated 3 out of 5 by Stanley from Compact Radio Case I use the product to hold four PocketWizard III transceivers which are used to trigger speedlights. What is great is that the product holds 4 units as advertised, but barely. There are two movable velcro inserts inside that help separate and protect the transceivers from each other. The lid serves as an extremely small pocket for the cables that go with the transceivers. I need room for 4 cables but there is not enough room for all 4, and the top's bulge is quite pronounced. What is great about it is its color - I'm not going to lose it easily, and the back straps that snap closed so the product can be attached to a belt or shoulder strap. Price is nominal, too, which was a purchase attraction. The fabric quality seems excellent. Rated 4 out of 5 by seth m. from Nice Snug Fit For My PocketWizards Nice little pouch. Much like a camera/lens pouch with it's soft repositionable walls. My PocketWizard Plus III's fit perfectly (I have 4) and now I no longer have to worry about the Wizards getting beat up in my gear bag. My only complaint about this product is in the lid of the pouch. It has a built-in little mesh zippered pocket for cords, adapters, etc, but it's SO small you really can't fit much in there. If you have 4 PocketWizards in the pouch, it would be nice to be able to fit all the necessary cords in that mesh pocket, but I can't even fit one miniphone-->hot shoe flash sync cable in there (PocketWizard brand). If they made the lid a little taller/deeper so more cables could fit in there, that would be a great improvement. Rated 5 out of 5 by Atlanta GF from Handy way to protect and to find The bag is well padded and has movable section inserts. Small pieces of equipment are easy to lose and are easy to damage. This bag took care of both problems. Having my PocketWizards in a bright orange padded case means they leave with me, properly protected, and that they are not left behind. Rated 4 out of 5 by Dormant from Great, lack of space for 4 PW + cables I bought this for my two PocketWizard Plus IIIs. It's meant to take four, but it's full carrying my two PWs, all the cables that came with them, two Hildozone caddies, and spare batteries. Loving the orange colour. Rated 4 out of 5 by Sallyann C. from Great Case Holds up to 4 pocketwizards (Plus iii and x). Durable. Would like that the inside pocket was a bit bigger (in order to hold ALL the wires that came with the PocketWizard. Rated 2 out of 5 by Brian from Too Small for Caddies This case is too small to store PocketWizards with caddies, making it a bit frustrating to remove and reattached caddies with each use. Rated 5 out of 5 by Ken Settle Photos from A great pocket for the Pocket Wizards!! I have long been a user of Pocket Wizards to trigger my flashes in the studio and on location. The problem was that I never could find a suitable means to transport them on location. The Wizards would bounce around loose in the camera bag or get shoved into a ziplock baggie to be transported in a lighting case. Just on a whim I decided to look right under my nose on B&H and the Pocket Wizard websites to see if a more useful and elegant solution existed. Alas! The G-Wiz Squared Gear Case! Built like a tiny camera case, this ingenious little offering gives me moveable dividers and space for four Pocket Wizard IIIs and a few cords. It fits right into my accessory section of my lighting case and keeps the wizards safe and sound and firmly in place until I get to the location. The best accessory I have bought in a couple years!! Why is the blue more expensive than the orange and the orange more expensive than the black? No idea, I bought the cheapest one.